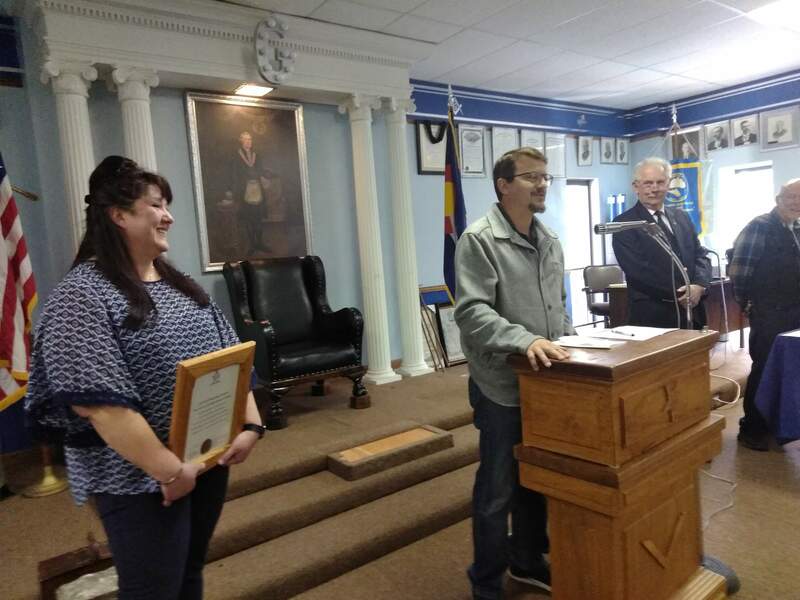 Dayna Talamante Montoya receives her award as an Outstanding La Plata County Teacher on Sunday at the Durango/San Juan Mason Club. The Durango/San Juan Mason Lodge honored students, teachers and first-responders on Sunday at its annual award ceremony. “You hear the educational system isn’t all it’s cracked up to be, but I can tell you serving on the Scholarship Committee for years, there are a number of brilliant kids out there,” said Jeff Jaeger, chairman of the committee. Jaeger presented the Emory E. & Goldie Smiley Memorial Scholarship to Kyla Thomas of Durango High School. Thomas plans to attend University of Colorado Boulder. Masons also honored other students, law-enforcement officers and first-responders at the ceremony attended by about 100 people at the Durango/San Juan Mason Lodge, 421 Turner Drive. Deputy Scott Blakley was named Emergency Services Personnel of the Year for La Plata County Sheriff’s Office. Lt. Tom Cowing of the Sheriff’s Office recounted how Blakley performed CPR on a unresponsive newborn who was born on Nov. 24, 2018, in the family car in Hesperus as a family was en route to Mercy Regional Medical Center from Mancos. “He helped save a newborn. It’s a textbook example of the work done daily by people in law enforcement,” Cowing said. Ignacio Middle School Principal Chris deKay said the way he looks at education had been transformed by Dayna Talamante Montoya, a counselor and lifelong resident of Ignacio, who was named Ignacio Middle School Outstanding Teacher. “I’ve come to appreciate from Dayna that if kids don’t feel good about themselves. If they are not in a good, safe place at home, they can’t learn,” he said. Junior Students of the Year: Grady James and Greta Cahill, Animas High School; Dylan Hilliker and Bronwyn Hunter, Bayfield High School; Jason Foutz and Isabela Torres, Ignacio High School; Luke Ford and Kalista Peña, Durango High School. Amadeus Shaw and Kate Zarlingo; Big Picture High School. Outstanding La Plata County Teachers: Carlin Nielson, Animas High School; Jennifer Moore, Bayfield High School; Susan Nelson Bayfield Middle School; Leroy Sanchez, Durango High School; Chelsea Reinsche, Big Picture High School; Talamante Montoya, Ignacio Middle School; Gwynna Reinhardt, Ignacio High School; Dory Daniels, Miller Middle School; Michelle Fletcher, Escalante Middle School. Emergency Services Personnel of the Year: Andy Miller, Upper Pine River Fire Department; Scott Fenwick, Colorado State Patrol; Blakley, La Plata County Sheriff’s Office; J.J. Rouanzoin, Durango Police Department; Steve List, Durango Fire Protection District.